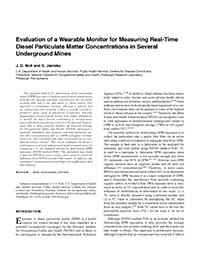 The standard method for determining diesel particulate matter (DPM) exposures in underground metal/nonmetal mines provides the average exposure concentration for an entire working shift, and it can take weeks to obtain results. This approach is problematic because, although it reports that an overexposure has occurred, it fails to provide critical information about cause or prevention. Conversely, real-time measurement would provide miners with timely information to identify the major factors contributing to overexposures and would allow engineering controls to be deployed immediately. Due to these potential benefits, the National Institute for Occupational Safety and Health (NIOSH) developed a wearable instrument that measures real-time elemental carbon (EC) concentrations (EC is a DPM surrogate) via laser extinction. This instrument was later constructed into a commercial version (Airtec). This article evaluates the Airtec's performance in several underground metal/nonmetal mines by comparing it to the standard method for determining DPM exposures (NIOSH method 5040). The instrument was found to meet the NIOSH accuracy criteria and to show no statistical difference from NIOSH method 5040 results. In addition, the instrument's measurements were found to be unaffected by dust and humidity.